The technology group Wärtsilä and Hidrovias do Brasil have signed a 5-year Optimised Maintenance agreement on the fleet of eight pusher tugs operating in the challenging rivers of South America. The agreement enables flexible maintenance planning and execution according to the real condition of the equipment, thus ensuring better lifecycle value for the vessels. Hidrovias pusher tugs offer high-quality logistic solutions for the transportation of agricultural commodities, ores, steel products and other loads, with customized long-term projects in the rivers of Paraguay, Brazil, Argentina and Uruguay. 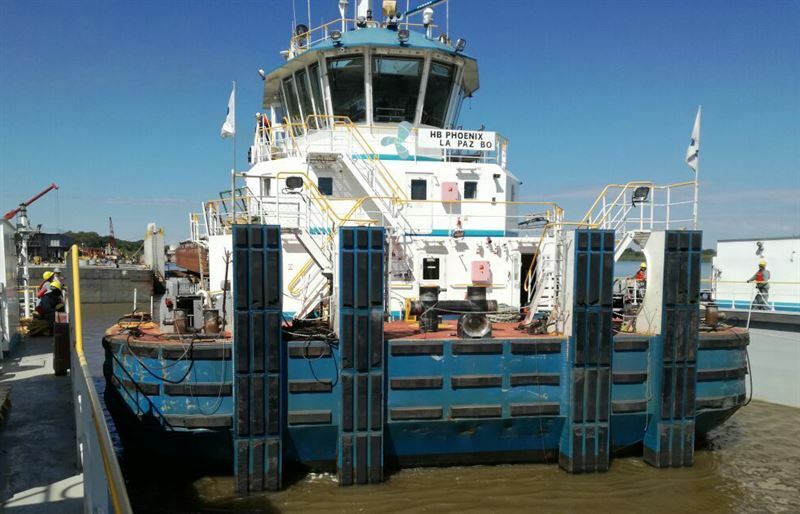 Vessels are operating in demanding shallow waters and remote locations, which makes maintenance planning and execution challenging for pusher tug operators. The maintenance solutions offered by Wärtsilä include engine condition monitoring system, which enables Dynamic Maintenance Planning (DMP). Maintenance planning and execution will be made in accordance to the real condition of the equipment, providing flexibility for the operator and ensuring maximum uptime for the vessels. “We expect and trust that with this agreement, we are able to maintain or even further improve the availability and utilisation of our vessels safely and economically. Close cooperation with Wärtsilä and the extensive scope of services, monitoring and planning will assure the maximal lifecycle value of our vessels, which is crucial for our operations, and our customers,” says Mr Alexandre Petterle, Supply Chain Manager, Hidrovias do Brasil. Hidrovias will also utilise Wärtsilä Online Services which gives them online access for technical information on their installations and provides a platform through which ask questions from Wärtsilä’s technical experts. “Both Wärtsilä and Hidrovias share the same passion to serve our customers and exceed their expectations,” says Walter Reggente, Vice President, Americas, Wärtsilä Services. “We are also strongly committed to enabling sustainable societies with smart technology. By offering Hidrovias our services that enable them to maximise the uptime of their fleet of vessels that are sailing in harsh and remote inland waterways, we are honouring this commitment. Rivers are a safe and cost-effective way of transporting goods to ports to be shipped around the world, thereby directly supporting the economies of South American countries,” continues Reggente.